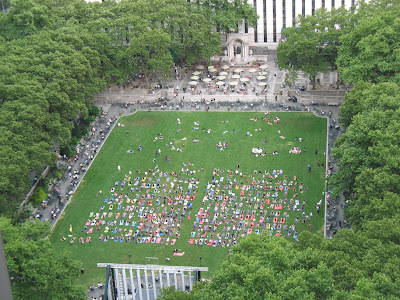 From 9am to 10am on Saturday, August 7, lululemon athletica is giving yogis an extra chance to practice in Bryant Park, outside of our wildly popular Tuesday morning and Thursday evening yoga classes. Salutation Nation is a simultaneous, nationwide event where yogis of all ages, backgrounds, and experience levels will practice together in celebration of yoga communities across the country (and Canada, too!). Two accomplished NYC instructors will lead Bryant Park yogis through an open level class on the lawn. Mats will be provided on a first-come, first-serve basis. If you have your own mat, bring it! Visit the Salutation Nation Facebook event page for more information, including an updated list of event locations across the country.